Small family run sporting camp on beautiful Salmon Lake in Belgrade, Maine. Open to outside events such as weddings, meetings or retreats. Doug & Candee are wonderful hosts and are exceptionally accommodating to their guests. 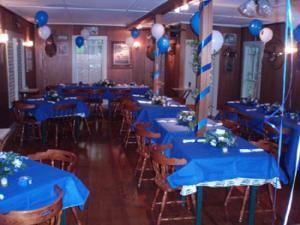 Located on beautiful Salmon Lake in Belgrade, Maine, Whisperwood is an ideal location for meetings, weddings, showers, family reunions or other type of group meetings. Their dining facility has a complete kitchen and can be private for your party.